The attempted arrest took place at 6.30 am at Alan García’s home. PERU’S FORMER PRESIDENT Alan García has died in hospital after shooting himself in the head at his home as police were about to arrest him. The attempted arrest, part of a graft investigation, took place at 6.30 am at García’s home in the upmarket Miraflores neighborhood of Lima. Police were acting on an arrest warrant for money laundering that would have allowed García to be held for 10 days, giving authorities time to gather evidence and prevent him from fleeing, the prosecutor’s office has said. “This morning there was a regrettable accident. The president took the decision to shoot himself,” Erasmo Reyna, García’s lawyer, told reporters outside the hospital where García underwent emergency surgery. President from 1985-90 and again from 2006-11, García was suspected of having taken bribes from Brazilian construction giant Odebrecht in return for large-scale public works contracts. 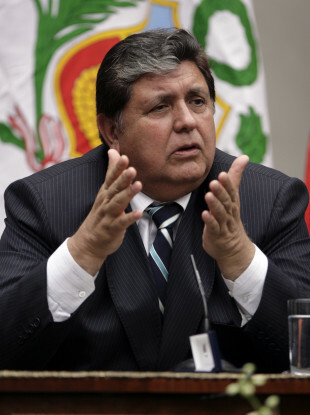 García, a social democrat, claimed to be the target of political persecution, an accusation denied by centrist President Martin Vizcarra. Garcia said he would neither try to flee nor hide again yesterday. Although under investigation by the public prosecutor’s office, García had not been charged with anything. Following this morning’s incident, Omar Quesada, the general secretary of García’s American Popular Revolutionary Alliance (Apra) party, confirmed the president had died as a result of his injuries. Email “Ex-Peru president kills himself after attempted police arrest ”. Feedback on “Ex-Peru president kills himself after attempted police arrest ”.